During the early hours of April 19th, former Gang Starr & Jazzmatazz front man, GURU died at the age of 48 of Heart failure, after a long battle with cancer. Described as one of the greatest Hip Hop artists of all time, the sudden death of the man credited with being one of the architects of Hip Hop/Jazz, sent shock waves through the music industry. Born Keith Elam, into a middle-class family in Boston, Massachusetts in 1961, GURU, as he would later come to be known, began his career as a Rapper after dropping out of Atlanta's Morehouse College during the 1980's, later forming the group Gang Starr at the age of 27. Initially adopting the name; MC Keithy E, GURU's group enjoyed mediocre successes with three early releases produced by DJ Mark 45 King on Wild Pitch records, before he eventually teamed up with Houston, Texas born Christopher Edward Martin, more commonly known as legendary DJ Premier. After changing his stage name to GURU, (which is an acronym for Gifted Unlimited Rhymes Universal), he's group landed their first major success with the LP 'No More Mr. Nice Guy', in 1989. Although Gang Starr are often credited with being one of the first group's to blend Jazz Breaks into their songs, it was actually DJ Jazzy Jeff's (of Jazzy Jeff & The Fresh Prince), 1989 single 'The Groove' which featured a remix with the late Saxophonist Grover Washington Jr. which was one of the earliest actual Hip Hop /Jazz collaborations in history, therefore probably making DJ Jazzy Jeff the actual Godfather of Hip Hop /Jazz. Nevertheless the next decade brought GURU a string of successes with first the LP 'Step In The Arena' in 1991, then their Multi-Gold selling LP 'Moment of Truth' in 1998 & the 1999 compilation 'Full Clip: A Decade of Gang Starr', which placed both GURU & DJ Premier in a league of their own, and indeed some would argue changed many people's perception of Hip Hop forever, which was mainly due in part to their single 'Jazz Thing', taken from Spike Lee's 1990 Motion picture 'Mo Better Blues' starring Denzel Washington. The single won Gang Starr an army of new devotees outside of the Hip Hop world, and also marked a turning point in GURU's career, which would later define him until his death two decades later. In Jazz Thing, GURU, assisted by the ingenious production skills of DJ Premier, using the sample of Duji, by Kool & The Gang was able to eloquently condense the early history of Jazz music, stretching back to its ancestral roots on the African Continent, in under 5 minutes, a feat which not only firmly established GURU as one of the Greatest lyricists of all time, but also educated many inner city youth about their inherent connection to Jazz, which is often mistakenly perceived as an Old White Elitist genre. In spite of impressive record sales, GURU's intellectual lyrical content, which has been described as "sharp eyed but anti-ostentatious", began to come into conflict with the, more money & crime-orientated, anti-intellectual Gangster Rap, which had taken hold of Hip Hop during the 1990s. 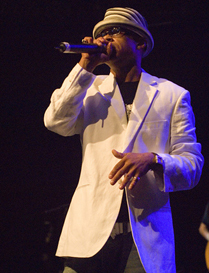 Finding himself in a position of having to increasingly defend Gang Starr's credibility often against those, jealous of the group's success, with tracks like 'Full Clip', GURU, began to slowly grow bored of, and indeed distance himself from negative mainstream Hip Hop, in favour of a more progressive Jazz based genre, which began with the release of the first of four solo project's in 1993 entitled 'Jazzmatazz, Vol. 1' which featured collaborations with Jazz luminaries such as Donald Byrd & Roy Ayers. As relations with DJ Premier soured, GURU further embraced Hip Hop/Jazz throughout that late 90's, and early part of the new millennium. Though he's 3rd instalment of Jazzmatazz failed to achieve the same critical acclaim as Volumes 1 & 2, GURU ignored the lucrative allure of commercial 'Gangster' style Rap, and instead continued recording and performing progressive Rap, which combined electronic beats with live Jazz, collaborating with artists like: Chaka Khan, Ramsey Lewis, Branford Marsalis & Jamiroquai, later recruiting his brother 'DJ Solar', to be his Producer & Co-performer. As Guru's health gradually deteriorated, it was his brother DJ Solar, (not to be confused with rapper MC Solar), who was credited with being the influence behind the production of GURU's less successful albums, as well as alleged to have further exasperated the feud between GURU and his former partner DJ Premier. Aside from his music career, GURU also donated his time and resources to a number of philanthropic causes such as 'Each One Counts', a non-profit organization dedicated to carrying out charitable work on behalf of abused and disadvantaged children, as well as researching a cure for Cancer. Despite ongoing animosity between DJ Premier and Solar, with some observers suggesting that Solar has attempted to hijack his brother's legacy, a Memorial Concert has been planned with DJ Premier, to pay tribute to GURU later this year. In a final letter to his fans, GURU stated: "I am very proud of what Gang Starr has meant to the music world.....I equally am proud of my Jazzmatazz series and as the father of Hip-Hop/Jazz. I am most proud of my leadership and pioneering efforts on Jazzmatazz 4 for reinvigorating the Hip-Hop/Jazz genre in a time when music quality has reached an all time low." In GURU, the world has lost a true genius, and visionary who tried to bridge the void which exists between Hip Hop & Jazz, and by so doing changed many people's perception of Rap music for the better. He has not only left an indelible mark upon both the Hip Hop & contemporary Jazz scenes, but was a true pioneer, whose legacy will live for many years to come. R.I.P.